Basic information in first 10 pages include Personal Date,Yellow Page,Personal Size, International Mesurement Conversion Tables,etc. Laying down ink on paper, you work very differently from using a computer. It's intuitive, deeper, personal. The notebook also benefits to improve your time management with executive ability, and ensures your plans fulfilled within set time. Perfect for taking notes and sorting out information, which provides a dependable and useful solution for your daily life. It has writing space big enough for you to complete a whole short story. Ribbon bookmark allows for easy making of important pages. 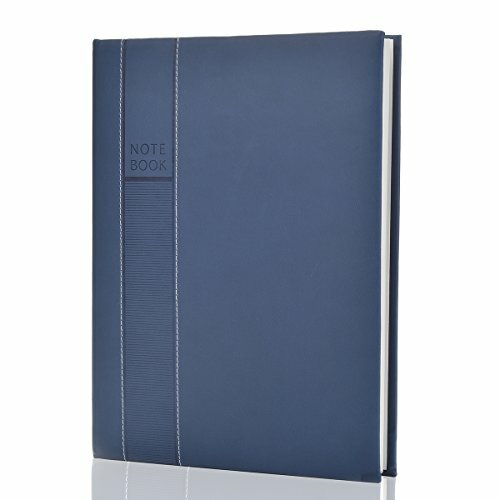 100% customer satisfaction guarantee, If anything at all goes wrong with the blue notebook, we will send you a replacement absolutely free, no return required! ❉Durable thread bound, enough to ensure pages don't get peeled away from the cover. The paper is thick enough to not bleed and feels good whether writing with pen, pencil or drawing with crayons!